This "new arrival" to the Guitar Adoptions inventory features a two piece swamp ash body and gun oil tint maple neck. The full moniker "Comanche Studio VI- Limited Edition" accounts for the six toggle switches, comprised of three 3-way coil switches & three 2-way pickup on/off switches. Standard Comanche's come with a conventional Strat 5-way switch plus one coil switch. But, if maximum studio versatility is what you seek, AND you have a pilot's license, the Studio VI one has all the goods! I'm mainly captivated by the gorgeous ash & honeyburst finish. It's easy to ooh & ahh over a maple top, but there's a lot to love about a nice simple wide grain ash with this type of finish-- not to mention lightness & resonance. 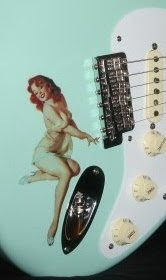 Guitar Adoptions is THE place to check out high end G&L USA guitars.